Limiting scientific debate: A change in the AGU policy on Presenting Alternative Scientific Viewpoints | Watts Up With That? Guest essay by Roger A. Pielke Sr. In the August 20 2013 issue of EOS both the AGU Statement on Climate Change [ http://onlinelibrary.wiley.com/doi/10.1002/2013EO340006/pdf ] and my comment on the Statement [ http://onlinelibrary.wiley.com/doi/10.1002/2013EO340007/pdf ] were published. However, I was not permitted to publish my Minority Statement in EOS, but only refer to its URL on another website. In this post, I want to share with you the policy announced by the AGU President, Carol Finn, in two e-mails to me. I extracted the text on this subject from her e-mails to me (which were also copied to others at the AGU, so that these e-mails should be considered open communications). First, I want to reiterate the supposed AGU policy on Forum articles in EOS from their website link http://onlinelibrary.wiley.com/journal/10.1002/(ISSN)2324-9250/homepage/categories_of_contributions.htm. I have highlighted a specific sentence. Forum contains thought-provoking contributions expected to stimulate further discussion, within the newspaper or as part of Eos Online Discussions. Appropriate Forum topics include current or proposed science policy, discussion related to current research in the disciplines covered by AGU (especially scientific controversies), the relationship of our science to society, or practices that affect our fields, science in general, or AGU as an organization. Commentary solely on the science reported in research journals is not appropriate. Maximum length: 1500 words; usually figures are not included, but when they are, each counts as 400 word equivalents. My minority statement certainly fits within this Forum framework. However, a (new) AGU Policy that, in my view, limits scientific debate within the AGU was announced by the AGU President. As you know, Eos is the official transactions of AGU. Your draft alternative to AGU’s climate position statement falls outside of an official transaction of AGU, and therefore cannot be published in Eos. Forum articles cannot be extended commentary on a previously published Eos article, such as the report on the new climate change position statement. Quite frankly, I am disappointed that as prestigious a professional society as the AGU, of which I have always been proud of my association, has now decided to limit the exchange of scientific perspectives within the primary medium of communication within our society (EOS). This AGU venue of publication has now become more of an advocate for particular perspectives than a venue to advance our knowledge of science issues. While in this case, it is dealing with climate science, the issue actually goes to the core of any controversy within any subject areas that are represented by the American Geophysical Union. Seems the AGU thinks politics trumps science now. We need a debate, they don’t want one because they are afraid of the outcome. Thou shall not notice the mann behind the current. This is typical academia, dissent is evil and shall be forbidden. Policy? Policy is for the wee people. Me thinks your institution is dead on its stump. Thankfully Anthony has been demonstrating the future of scientific discussion here at WUWT with great success and charm. It looks more like the science of gate keeping. Maybe the creation of a new AGU is in order. The AGU is morphing into a flat earth society, ironically. Dr. Finn appears to believe she is preserving the credibility of the AGU, but the opposite seems to be true. It sounds like they’ve moved policy closer to intent but no closer to need. Score one for the gatekeepers. Twitter has more freedoms. Since Peter Gleick was welcomed back to its meetings I have never understood why anyone with any integrity is involved with the American Geophysical Union. The AGU has no integrity. So why be associated with them? by fraudulently representing itself as science. Why is it that the well connected elites have such a fondness for railroads, particularly big, fast, expensive railroads that take you where they want to go and you can only get onto this railroad with their permission (peer review). I wonder if Dr. Finn realizes how superfluous her railroad is in the age of an information superhighway where everyone has an on-ramp and can select their own destination? Science by decree, policy or position paper is not science. but one of religion where members who wish to express alternative points of view about the official dogma are excommunicated. Carol Finn’s statement is just a convenient pretext. Opportunistic pretext is widespread among climate science officials as a preferred means to shut out critical debate. Pretext provides the internal dissimulatory latitude that allows them to get their way without confronting their own dishonesty. In the first quote above, Carol’s personal latitude turns upon the subtle re-definition of “official transaction” in her two uses of it. The first time around, it means publication in an official AGU magazine. The second time around it means official position of the AGU organizational management. But as Carol has used the same phrase twice, she can pretend it means the same thing in both instances. Thus: latitude to avoid confronting her dishonesty. Carol just renames critical response to be “extended commentary,” and decides that disallowing the latter is OK because the words are different even though the contextual meaning is the same. Thus: latitude to avoid confronting her dishonesty. So there we have it. In the first instance, Carol utilizes the same phrase but opportunistically applies different meanings, while in the second she utilizes different phrases but opportunistically applies the same meaning. All done as a pretext to suppress debate, while maintaining the internal fiction of integrity. Red Queenitis, internalized, in action, and in view before us all. So EOS joins Scientific American and National Geographic, far removed even from my canary’s cage? So much to read, so little time. Thanks for the warning note. Carol got the job to do this one single job exclusively. The only rational response is to continue arguing for what you consider to be correct. Welcome to the Age of Scientific Denial. It is not the skeptics who refuse to debate and openly discuss the contradictions of climate science. I called up this article after seeing the title, thought it was an accidental reposting of an old story, seemed very familiar. But why should it matter if AGU limits debate? They’ve embraced Post Modern Science (PMS). They have all the facts they need or want. The time to debate is over, now it’s time to get on with the advocacy! No, it is not gender related. This is corruption stemming from a disregard for the truth. They had Peter Gleick (male) as their ethics expert. And they weren’t ashamed when he was exposed. How will professional science unwind itself from CAGW? Is Dr. Finn authorized to change the rules? Your little essay is brilliant, brilliant, and brilliant. I wish everyone had your appreciation of the language. It seems to me people looking for discussion will simply set up a common discussion forum and people will go from EOS to the forum. Then people will start skipping EOS altogether and start at the forum, much as we do with WUWT now. Then people might start skipping AGU together because it will have ceased being responsive to the interests of its members. Other than AGW acolytes, I don’t know why any legitimate scientist would want to belong to such an organization. Absolutely disgraceful. How long will it be before dissenting viewpoints are classed as “anti-societal” and subjected to forced psychiatric “rehabilitation” in state institutions? This was the practice only with political dissidents in the USSR! Are American academicians trying to go one step further? You may be a minority but so am I. I did not submit any comments on their position statement but now that I see what they are up to I just might. They will keep hearing from me if they choose to not respond. How odd Pielke should chose a blog notorious for its censorship of inconvenient ideas to communicate his distress. and the mind-numbing predictability of a tag team like Pielke <i.pere et fils. Only thoughts approved by the politburo will be published. unable to print a reduced sized number two. Ha! I just looked up the AGU webpage, just for fun, and this is what is running as their top news item: “James Hansen to Deliver Frontiers of Geophysics Lecture”. This is sheer, unhinged, moonbattery. There is no excuse for anyone with integrity to remain affiliated with these clowns. Whatever value this organization may have once had, it’s nothing but fraud and nonsense anymore. Was the AGU founded by a certain Russian pseudo-scientist called Lysenko? These establishment scientists are going to support the political purposes of their funders, the statist establishment. Hey, we need the grants money! Allow me to correct you Herkimer, science by the means your describe are about power, which leads to money. Google Lysenko. So rivers in Australia don’t empty into the ocean? I knew it was a strange place with Christmas in the summer and all that, but not that strange. So, if all the water in Australia was suddenly dumped into the ocean, how much would the global sea level rise? Would it even amount to 1 millimeter? The AGU has become anti-science. Why do any of the AGU’s members continue to pay their dues? It is time to get a membership list and to make sure that the members know what they are supporting. It is also important that this membership list be published so that others know who these “scientists” are and what they support. How badly are they programming the automated smearbots that they alternate between English and French? How odd Pielke should chose a blog notorious for its censorship of inconvenient ideas to communicate his distress…. If there is censorship here why am I seeing your comment HMMMMmmmmm? The stated positions of the AGU management, as illustrated by Dr. Finn are what led to my resignation from AGU a couple of years ago, after more than 50 years of membership. I have published in JGR , EOS, and Abstracts volumes, and attended annual meetings in San Francisco and Washington/Baltimore until 1996. Conversion to the current state of affairs leaves me with a sense of disgust mixed with regret. Only after eco-totalitarism runs its course, like any other totalitarism in history including the worst. History repeats itself… sadly. To achieve this mission, AGU identified the following core values and behaviors. We advance Earth and space science by catalyzing and supporting the efforts of individual scientists within and outside the membership. As a learned society, we serve the public good by fostering quality in the Earth and space science and by publishing the results of research. We welcome all in academic, government, industry and other venues who share our interests in understanding the Earth, planets and their space environment, or who seek to apply this knowledge to solving problems facing society. Our scientific mission transcends national boundaries. Individual scientists worldwide are equals in all AGU activities. Cooperative activities with partner societies of all sizes worldwide enhance the resources of all, increase the visibility of Earth and space science, and serve individual scientists, students, and the public. AGU staff work flexibly and responsively in partnership with volunteers to achieve our goals and objectives. Here, in my view, professional organizations like AGU and EGU are failing. Rather than writing position documents about climate science they should worry about the integrity of climate science and making sure that science can evolve wherever it wants to go. If we – by way of our professional organizations – are not defending the integrity of science, who will? It is a safe bet that no one else does. The AGU appears to be following in the footsteps of the U.K. Royal Society: Its advocacy foot is leaping forward, while integrity (with so little support to sustain its pace) trails so far behind, it is rapidly crumbling to dust. When you limit or restrict scientific debate, you step out of the field of science and into the political world where truth is murdered for political gain. More of the same. Just look at what the IRS did to the opposition of the administration prior to the last election. They created complete atrophy within an organizing party. How you say? Simply by stopping their abiliy to formally fund as a group. Brilliant strategy after the trouble in 2010, more importantly, effective. The political climate for the AGU is no different, and trained by the same bunch, for policy sake. Sad really, but scary just the same. Right in front of you. It seems to me the lack of calibrating ones moral compass leads to the failure of successful navigation in the end. Roger Pielke Sr. Sir – I am one who CHEERS whenever I see your name. Long may you speak out. Oh Carol you are just a fool please please leave the AGU. Does the AGU fall under the Obama Administrations Executive Order on Scientific Integrity.. Its silence opposing views in the Department of the Interior, DOD, EPA, NRC, USGS among other scientific driven groups. If you dont believe then you dont belong.. To paraphrase the Interior secretary…. I hate it now that these all fell into religion and agenda.driven garbage. She just isn’t very bright. You can make this sort of person squirm by making them define their terms. For instance, ask her to define “critical response” vs “extended commentary.” What you will get if you keep pressing her is a series of rationalizations, each more convoluted and ridiculous than the last. She hasn’t thought any of this through. She could have said you can’t publish “because you have cooties” and it would both have made more sense and been more truthful. People get positions like hers because they are politically reliable. “Akin to, and largely responsible for the sweeping changes in our industrial-military posture, has been the technological revolution during recent decades. In this revolution, research has become central; it also becomes more formalized, complex, and costly. A steadily increasing share is conducted for, by, or at the direction of, the Federal government. I agree with Ric Werme. When AGU refuses to allow open discussion, it does not mean that the discussion will not take place. The internet is powerful and there are increasing numbers of places where ideas can be exchanged. AGU will find itself an observer, rather than an active participant. People get positions like hers because they are politically malleable. There – I fixed it for you. Russell is an idiot, that’s why. He needs to get a life. The AGU’s president is lacking enlightenenment of late. Where can science exist without enlightenment? The current AGU president is an unenlightened practitioner of American pragmatic limitation. The American ‘classical pragmatists’ were Charles Sanders Peirce (1839–1914), William James (1842–1910) and John Dewey (1859-1952). American pragmatists opposed the idea of concepts. AGU as anti-conceptual is anti-epistemological. N’est ce pas? Now some, not Eli to be sure, might think that Prof. Pielke has not been paying attention to what AGU leadership has been saying. If nothing else <Christine McEntee, the AGU CEO put it on the line at the Fall 2012 meeting (hope the link still works, else see the RR link). I’m afraid that the management of scientific societies today has largely been assumed by those who are not really practicing members of their profession, but those who desire to specialize in management of professional societies. They are not motivated by scientific issues, but success in their chosen field, which is exercising power over those for which they subconsciously know are their superiors in the actual scientific field. Most true scientists wouldn’t want the job–they’d rather be doing science. Let us now gain some further insight into the fundamental character of Mike Mann. On a completely unrelated note, I was wondering if you, perhaps in tandem with some of the other usual suspects, might be interested in returning the favor (of being awarded a Fellowship of the American Geophysical Union) this year ? Now we know why he was so adamant about securing Jones’s award! I’ve looked over the current list of American Geophysical Union Fellows, and it seems to me that there are quite a few who have gotten in (e.g. Kurt Cuffey, Amy Clement, and many others) who aren’t as far along as me in their careers, so I think I ought to be a strong candidate. If he does say so himself. Anyway, I don’t want to pressure you in any way, but if you think you’d be willing to help organize, I would naturally be much obliged. Perhaps you could convince Ray or Malcolm to take the lead? The deadline looks as if it is again July 1 this year. I’m looking forward to catching up with you some time soon, probably at some exotic location of Henry’s choosing. Does any remnant of doubt remain that awards in this field are absolutely and completely meaningless? Mann may as well pin a gold star on his own chest! Do they call this new AGU policy “The Mushroom Policy”? The AGU mandarins have joined hands with Lysenko to destroy Science in favor of politics. This will end badly. Yep, the AGU got itself a professional PR hack. AGU should change their name to American Political Geophysical Union. Leave them and start a new one called American Scientific Geophysical Union? Looks like she is after public funding also for herself? Or maybe a job in politics? Who owns the AGU? The members? Kick out today’s board and the leader behind this? lol, Jon (10:06pm). Or just plain old P.U.. Appropriate Forum topics include … policy, … society, … organization. … science … is not appropriate. I’ve asked this question before who is Henry and where is the exotic location. The sentance as a whiff of corrupt or corrupting behaviour? The way in which Dr. Pielke has been treated by the scientific establishment totally awakened me to what is really going on the subject of the climate debate when I started looking deeper into it and using his material in some online ” discussions” ( bloodbaths actually, lol). Of all people who deserve to have their views considered by any organization, I can’t think of anyone more deserving. His ideas on the other likely human influences on climate and the uselessness of climate models in multi- decadal predictions have formed the core of what I believe and argue with alarmist ideologues. Thank you, Dr, Pielke, and please post here more often as you have the time. It’s like having a great guest lecturer in class from my college days! And thank you Anthony for opening up your site to amateurs such as myself. I’ll try not to abuse the privilege.
. . . a censor whom Tony also suffers to maintain a sockpuppet on the site– ‘Smokey ‘ and dbstealey are one and the same. Their posting-eras don’t overlap. “Smokey” stopped posting maybe five months ago. About four months ago dbstealy began posting. The change may have been due to WordPress’s antics, which arbitrarily (seemingly) assigns one of the different user names one has signed into its various sites. For instance, it shifts back and forth between calling me rogerknights and Roger Knights. EOS = End of Science. I can’t really decide which organisation to join. The one that allows free debate among 176,000 people or the one that stifles debate amongst 61,000 people. Just out of interest the membership of the AGU in 1990 was 26,000 so they have not done too badly in getting up to 61,000. No doubt the criteria have changed, such as going international etc. Who died that a position statement cannot be challenged by AGU members in the AGU journal? Call it what it is – censorship. Any individual who is professionally engaged in or associated with the geophysical sciences may become an AGU Member. Individuals who desire identification with AGU and wish to support its objectives but do not meet the Member qualification may join AGU as Associate Members. These individuals enjoy the benefits of AGU membership but may not vote or hold office. $50 and you are part of a “galvanizing” organization. I am shocked beyond belief that a Harvard Professor can be so dumb in his postings/comments. How in the world is he not fired by the University? There goes another fine opinion I had.. about Harvard that is. Why would the AGU or any other scientific organization for that matter feel the need to take a position on Climate Change? Do they have a position paper on for example Gravity? Perhaps the AGU can tell us all the propagation speed of Gravity in their position paper. Is Gravity limited to the speed of light, or does Gravity exhibit “spooky action at a distance”. And what difference would it make if the AGU took a position either way? Would it increase the accuracy of prediction of the trajectory of objects under the influence of Gravity? Or would it tend to limit accuracy to our current level of understanding and thus hold back progress? And perhaps the AGU would like to publish a position paper on Relativity? Perhaps they would like to explain what happens when you fire two projectiles in opposite directions, both traveling at 60% of the speed of light. Both objects are traveling away from each other at 1.2 times the speed of light, in a universe where we believe the speed of light to be an absolute. Perhaps they would like to explain the physical mechanism underlying time dilation and length contraction in their position paper. Unfortunately the need for funding, largely derived from government and thus subject to political interference, has largely constrained scientific research to politically popular explanations of the real world, largely without regard for what Nature is telling us. There is a reason we have a long history of respecting the opinions of our elders. It is because they are in large part removed from the need to make a living day to day, and thus cannot be easily manipulated. History shows us that the actions of the AGU in censoring Dr. Pielke follow a long tradition of the scientific establishment of the day in censoring the correct explanation in favor of the politically acceptable explanation. Politically correct speech is precisely what it claims to be. It is politically correct speech. It is not scientifically correct speech, nor is it free speech. I am shocked beyond belief that a Harvard Professor can be so dumb in his postings/comments. while in the real world this would tend to hold one back, in Harvard it is a positive boon. Having succumbed to Gramscian guttersnipes, the “prestigious” American Geophysical Union (AGU) will shortly find itself mouthing its kook rhetoric to a shrinking audience of encopretic ideologues. Rome was not built in a day, but it can well be lost (Constantinople, May 29, 1453). Any self-respecting geophysicist had best depart the AGU for greener pastures, starting now. Amateurish & disgusting. Get help. If Dr Seitz is apparently willing to commit fraud on such a small stage as a blog site, it is reasonable to wonder if he learned on this on much larger stages. It would appear that Dr. Peter Gleick is much more representative of the true nature of academics/intellectuals than previously thought. No wonder Gleick was rewarded for his behavior. Frankly I would bring Steitz’s little fraud to the attention Harvard. It would be interesting to see if they circle the wagons or actually consider the idea that one of their own committing fraud and public lying reflects poorly on them all. Just wanted to give a shout out to the childish Russell, whom I have had the displeasure of interacting with on other sites. It is sad that he uses his capabilities (would not call it intellect) for evil and not good. What kind of person thinks of something like trying to make it look like he was censored in his own comment? Only someone who is so desperate that he is willing to destroy his own credibility to discredit others. He is an embarrassment to academia. Presumably the “(SNIP)” inserted by the author of the post was intended to defame the moderators and the reputation of the worlds number 1 science blog. If the author is a professor at Harvard and is actually using a Harvard network IP and server surely he is in breach of Harvard code of conduct and ethics? Is this not what climategate and the Gleick affair is all about, the lack of ethics and “scientists” making things up to prove their catastrophic human caused climate change theory? To then compound his actions by complaining about ‘censorship’ when caught out beggars belief! So this is what climate scientists do now, make things up (lie) to prove a point then complain that they have some holier than thou moral authority when they are caught out? Presumably we now know why they were photoshopping Nazis heads onto pictures of themselves. Keep catching them out Anthony, his shameful attempt is there on this blog for us all to see. true, true. Personal attacks or insults of either Dr Meier or the AGU politicals should be self-limited, self-edited. But, in today’s Washington environment of slavish political obedience, he and his administration – who openly and deliberately declare as the highest possible government (bureaucratic) Department Heads – that THEY will refuse to even ALLOW discussions, much less debates or arguments or studies that might find evidence against their dogma; and who will never fund a study that “might” contradict it, and- if such information IS found accidentally by someone accidentally funded to provide some other data, will NEVER promote or publicize such “new” information. I just looked at my post from last night at 11:18PM. The two videos I posted (Disney cartoons) were displayed with a frozen frame last night. Today, they have been reduced to links. Have my video posting privileges been restricted? Am I no longer allowed to get to create my little dramatic graphics (using the opening video frozen frame)? If so, may I please be told why? If I have done something wrong, may I please have a second chance? Thank you. I notice that “Smokey” still posts occasionally on Real Science and one or two others. Russell Seitz must be a very unhappy character. He attacks everyone, using the most unimportant shots he can find, and he is very vicious. Anthony certainly is not a liar. I know Anthony Watts, and you could not find a more honest, straight-shooting person. He has an exceptionally good moral compass, and he certainly does not lie. IMO calling Anthony a “liar” is just Russell Seitz’ projection. Seitz hates him because Russell is just the opposite — a Peter Gleick type. Unfortunately, those types congregate in the alarmist contingent. They do not have the science to back their beliefs, so they make personal attacks. The number of blogs set up to attack this site is amazing. But they get no traffic. All those blogs put together don’t get 5% of WUWT’s site traffic. Really, who wants to read personal attacks from misfits? We want science discussion, not name-calling. This is the gold standard of climate sites. You cannot keep everyone happy, but then they are free to start their own blog if they don’t like the way Anthony runs this one. Just the fact that WUWT has gone from zero to more than a million reader comments, and well over a hundred million unique views in only five or six years, means that their opinions are read by a lot of folks. 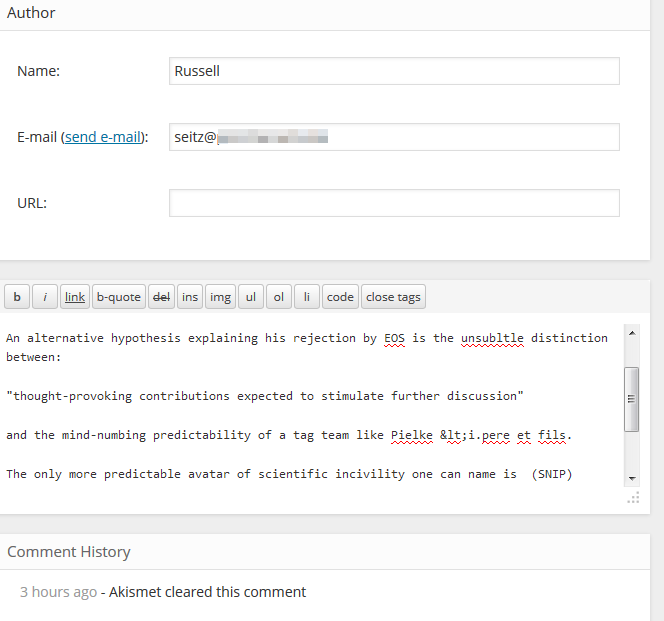 Why make a comment at a blog where you could easily be censored, or like me, where your comment is never published? If someone wants to reach a very large audience, this is the place. But if you want to reach out to only a handful of readers, there are plenty of blogs like Hotwhopper. Thanks, dear Mod, for responding. That’s great! I’ll just re-post the second part of my 8/23/13 post below and see if the videos stay as a frozen frame this time. 2. He is a liar. The more egregious point is they do this with full knowledge because they do not have control of the facts necessary to disprove what is being stated. One must simply look at the climate-gate emails to understand that this is their only defense from being shown purporting fraud. Control through fear. Happily Anthony knows his software and how it functions enough to cut a potential manufactured threat to the site off at the knees. Dam those pesky server logs.. This is one of the greatest disservices a professional can do to their organization and their profession.. They must be very upset that their gravy train of government funding is now coming closer to an end. Just like that cornered animal they will bite.. A self-destructive behavior and very Glikish of Dr. Seitz.. Do not fret for them, their respective organizations will circle the wagons and welcome them back. (That is the true devastation to science as whole) Both they and their organizations are now suspect. Now whom do you trust? That is the question. Therefore, there is no point to paying attention to anything he has to say. Thus, I would ban him permanently, Anthony. Surely there is a cartoon in all this. A demolitions expert blowing up the scientific process? Just too easy. Just to note – I hope no one confuses this Russell Seitz with the late Dr. Frederick Seitz, who was one of the organizers of the Oregon Petition project and should be counted as one of the true heroes of the skeptic community. His introductory letter on the Petition Project website says it all. The AGU’s losses are the AAPG’s and Society of Exploration Geophysicists (real Ph.D. in Geophysics required) gains. The American (Soviet)Geophysical Union’s days are numbered and diminishing day-by-day like their “net-gain” on publishing fees which have been ‘net-loss’ for many years and accelerating notwithstanding the Grecian astrological proclamations from the Politburo and Wolfenstein High Command Illuminati. Worry worry the poor AGU. Dollars from Washington DC are not flowing like blood from the hapless homeless deceased body into the veins of the recipient Anointed sucking whore. The Whore never even asked ME for a Yea nor Nay on her putrid stinking ‘Policy’ yet presumes that the entire membership are … abiding. This One, does not abide the whore. I recently posted a photo (not on WUWT) using WordPress. Clicking on it was to bring up a larger version. It did but rotated 90 degrees. I’d like to know why. Anyway, on WUWT (also using WordPress) I’ll suggest rather than feeling paranoid about such things, just chalk it up as a computer ‘bug’. Not coherent. But aside from that, what business has the Union taking a position on any subject area? It’s an open forum, not a policy institute. after the fraud was known shows poor and biased judgement of their leadership so what does one expect from them? Apparently AGU understands which side of their bread has the butter on it. How much money is generated annually from sources somehow related to “global warming”? I stopped today at the AGU page here: http://sites.agu.org/ and James Hanson’s face staring back at me was the first thing I noticed front, top, center of the page. Any scientist with integrity and concern for his/her reputation should immediately resign from the AGU and distance themselves from it. All these warning bells are ringing and those with ears to hear them should listen. But scientists are more equal than others. But SOME scientists are more equal than others. The AGU and its journal EOS have exhibited odious behaviour for at least a decade. I believe that the AGU and its Transactions journal EOS have much to answer for. I am unaware that the AGU has ever “come clean” on its past transgressions, some of which are outlined below. Please correct me if I missed suitable corrective action by the AGU or EOS. The AGU should publicly acknowledge and apologize for its ethical transgressions, such as those described in my aforementioned 2005 E&E article. Once the AGU has cleaned up its own house, then it may be qualified to comment further on the contentious issue of alleged catastrophic humanmade global warming. Until it makes suitable amends, I regard the AGU as ethically contaminated, and unfit for human consumption. But such bullying is not unique, as other researchers who challenged the scientific basis of Kyoto have learned. Of particular sensitivity to the pro-Kyoto gang is the “hockey stick” temperature curve of 1000 to 2000 AD, as proposed by Michael Mann of University of Virginia and co-authors in Nature. Mann’s conclusion is the cornerstone of the scientific case supporting Kyoto. However, Mann is incorrect. Mann eliminated from the climate record both the Medieval Warm Period, a period from about 900 to 1500 AD when global temperatures were generally warmer than today, and also the Little Ice Age from about 1500 to 1800 AD, when temperatures were colder. Mann’s conclusion contradicted hundreds of previous studies on this subject, but was adopted without question by Kyoto advocates. In the April 2003 issue of Energy and Environment, Willie Soon and Sallie Baliunas of the Harvard-Smithsonian Center for Astrophysics and co-authors wrote a review of over 250 research papers that concluded that the Medieval Warm Period and Little Ice Age were true climatic anomalies with world-wide imprints – contradicting Mann’s hockey stick and undermining the basis of Kyoto. Soon et al were then attacked in EOS, the journal of the American Geophysical Union. 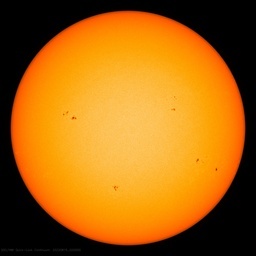 In the July 2003 issue of GSA Today, University of Ottawa geology professor Jan Veizer and Israeli astrophysicist Nir Shaviv concluded that temperatures over the past 500 million years correlate with changes in cosmic ray intensity as Earth moves in and out of the spiral arms of the Milky Way. The geologic record showed no correlation between atmospheric CO2 concentrations and temperatures, even though prehistoric CO2 levels were often many times today’s levels. Veizer and Shaviv also received “special attention” from EOS. In both cases, the attacks were unprofessional – first, these critiques should have been launched in the journals that published the original papers, not in EOS. Also, the victims of these attacks were not given advanced notice, nor were they were given the opportunity to respond in the same issue. In both cases the victims had to wait months for their rebuttals to be published, while the specious attacks were circulated by the pro-Kyoto camp. …………. A self-destructive behavior and very Glikish of Dr. Seitz..
A new term and I like it. Gleickish: To lie, cheat, steal or whatever it takes for a cause.